Influential Sierra Leonean rock band, formed 1961; disbanded 1972. Hassan Deen (b. Sierra Leone; vcl. ); Francis Fuster (b. Sierra Leone; drums), Balogun “Dynamite” Johnson-Williams (b. Sierra Leone; gtr. ), George Keister (b. Sierra Leone; bass), Geraldo Pino (b. to Sierra Leonean parents, possibly in Nigeria 1934 or 1939? d. Nigeria, 9 or 10 Nov. 2008; vcl.). The Heartbeats formed in Freetown to play covers (known as “copyright” in West Africa) of western rock and roll along with a budding repertoire of original material sung in the local vernacular, Krio. When, early on, the players became enamored of Latin music, their leader Gerald Pine changed his name to Geraldo Pino, and the Heartbeats recorded several original Latin-style numbers like “Oh Ye Charanga” in a nonsensical Spanish-sounding patter. The Congolese rumba, imported on radio and records, also exerted strong influence in the early sixties, especially when the touring Congolese quartet known as Ry-Co Jazz came to Freetown. The mellow, swinging rumba, tasty guitar licks, and flashy performances of Ry-Co Jazz captivated the capital and moved the Heartbeats to hire Hassan Deen, who could sing in the Congolese style. By the mid-sixties, American soul music—James Brown’s in particular—had supplanted the Heartbeats’ Latin and Congolese repertoire. Brown’s black power messages resonated in post-independence Africa, and soul’s rhythms and dances revealed connections that stemmed from the days of slavery. The Heartbeats performed tight covers of the latest soul hits with Pino doing a dazzling James Brown impersonation at the mike. Dynamite quit, replaced by Arnold Nylander, and the group began to tour West Africa, fomenting a soul revolution in its wake. West African soul groups like Ghana’s El Pollos and Barbecues and Nigeria’s Clusters and Soul Assembly all owed a debt to the touring Heartbeats. As the soul craze waned near the end of the sixties, the Heartbeats developed more original material still largely influenced by western pop. The group rarely returned to Freetown, preferring instead the lucrative night life of Lagos and Accra. Dissension within the band eventually led to its breakup. Pino remained in Nigeria where he continued to work in the entertainment business. Fuster went on to work with South African trumpeter Hugh Masekela’s band and performed with Paul Simon on the 1987 Graceland tour. Over their highly successful decade of existence the Heartbeats developed into the most influential group of musicians ever to come out of Sierra Leone. 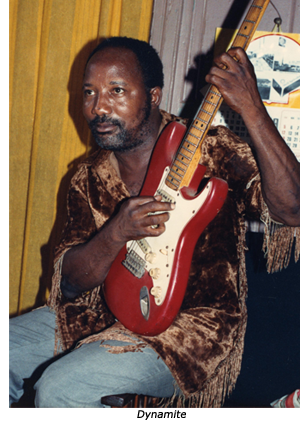 Their recording output was limited, but the group’s sensational live performances and their impressive array of the most up-to-date equipment captivated audiences all along the West African coast and forced competing bands to re-examine their own methods. “Maria Lef for Waka” (Pino 45 rpm GP1) 1963; “Oh Ye Charanga” (Pino 45 rpm GP7) 1965. N. Ware, “Popular Music and African Identity in Freetown, Sierra Leone,” Eight Urban Musical Cultures: Tradition and Change (Urbana, Illinois, 1978); G. Stewart, Breakout: Profiles in African Rhythm (Chicago, 1992).